We’d love your help. Let us know what’s wrong with this preview of Night Beach by Joanne DeMaio. Everything was in place for the perfect beachside gathering. Lace-wrapped jars hung from white chairs on the sand. Paper lanterns and tiki torches glimmered in the twilight evening. A rowboat draped with roses and vines waited in the wings. Love floated on the sal From the New York Times bestselling author of Castaway Cottage comes a novel as captivating as the moonlit sea. To ask other readers questions about Night Beach, please sign up. Readers again are left with a cliffhanger, so I am assuming The Little Beach Bungalow, out May 14 will start right where this one leaves off. I can’t wait for my next trip to the beach! This is the eight book of the Seaside Saga series but not the last, By now, I feel that these friends are my old friends! This book picks up where Castaway Cottage ended. The failed vow renewal of Kyle and Lauren Bradford sends both of them into anger and grief over their marriage yet they both still love each other deeply. Lauren had sent an invitation to Shane Bradford, Kyle's long lost brother. But she was not aware of the deep rift between them. We get backstory of the group of friends and s This is the eight book of the Seaside Saga series but not the last, By now, I feel that these friends are my old friends! This book picks up where Castaway Cottage ended. The failed vow renewal of Kyle and Lauren Bradford sends both of them into anger and grief over their marriage yet they both still love each other deeply. Lauren had sent an invitation to Shane Bradford, Kyle's long lost brother. But she was not aware of the deep rift between them. We get backstory of the group of friends and some but not all the story of why the brothers broke apart. Cliff Raines provides comic relief with aim to please and impulsiveness while Elsa calms him down and acts as a peacemaker and wisdom giver to the group. I like that she acknowledges that she can read people and that makes identify with her. Lastly, we are introduced to Shane Bradford, lobsterman who loves the sea and changed man from when the group used to know. I enjoyed this addition to the saga and think you will too. I received an Advance Copy of this book from the author and my thoughts and feelings in this review are my own. Night Beach made me feel like I was part of the residences of Stony Point, CT, made me want to think back and share past events and memories with the close knit beach friends, and believe second chances are possible. Kudos to Joanne DeMaio for another fantastic beach read. Keep them coming. Like a sudden sea breeze, the special evening quickly turns. And the residents of Stony Point mus Everything was in place for the perfect beachside gathering. Lace-wrapped jars hung from white chairs on the sand. Paper lanterns and tiki torches glimmered in the twilight evening. A rowboat draped with roses and vines waited in the wings. Love floated on the salt air. My Thoughts: The chaos left behind after the cancelled ceremony brought up memories for those in the beach community. Flashing back to the past and to a time before Shane Bradford did whatever he did to earn being “evicted” from their lives offered a peek into how things were back then. Whatever he did was not readily apparent to the reader, and even some members of the community were in the dark. Multiple narrators take us back to the past, as we watch the “time clock” of the present…and slowly we learn more. Along the way, the author takes us on a walk near the driftline, and we can almost see the ocean stars in the sea. As we peek into the cottages where the residents talk and share their thoughts, we feel a part of the community. In a little cabin in Addison, where Kyle and Lauren seek respite from the detritus of the day, we imagine how they will begin to heal. Night Beach is book #8 in Joanne DeMaio's wonderful Seaside Saga series. I've read every one of them and I find myself falling more in love with Stony Point and all of the wonderful characters with each book. I've come to think of the people from Stony Point as family and I love going back to check up on their lives. I love how each book picks right up where the last one ended. 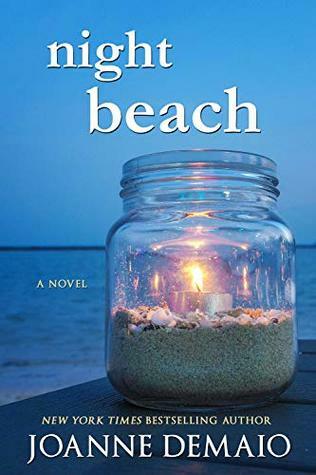 This is a series that would be so easy to binge read because you just want the story to keep going, continuing on with Night Beach is book #8 in Joanne DeMaio's wonderful Seaside Saga series. I've read every one of them and I find myself falling more in love with Stony Point and all of the wonderful characters with each book. I've come to think of the people from Stony Point as family and I love going back to check up on their lives. I love how each book picks right up where the last one ended. This is a series that would be so easy to binge read because you just want the story to keep going, continuing on with the love and friendships. Sure there are some troubled times, some conflicts among family and friends, but everyone comes together to help each other through the tough times, while also rejoicing in the good times. I've become so emotionally wrapped up in everyone's live, that I experience the tears of sadness and the elation of joy right along with them. "No, you don't always get to to choose who or what washes up in life's driftline." I just spent the most wonderful weekend with my longtime friends at Stony Point. We had all gathered at The Ocean Star Inn for our dearest friends, Lauren and Kyle’s, beachside vow renewal ceremony for their tenth year anniversary. They had experienced some hard times over the course of those ten years, and this was going to be a new beginning. For better times. The beach was all set up and gorgeous! Everything was perfect!! But an invited, but unexpected, guest stopped everything. And a night to remember follows. In true Stony Point beach style, it is amazing the way friends pull together and support each another during difficult times. Heartbreak, friendship and true love will rip at your heart as you follow their story. The driftline on the beach is the thread that sews the lives of these beach friends together. It's so easy to find oneself immersed in the story. I really didn't want it to end - kept watching the percentage climbing closer to 100, and didn't want to turn to the final page. A little more history revealed, a little more understanding of what makes them all tick. And eventual teaser for what will follow. The Little Beach Bungalow is anxiously anticipated. I was so glad to be back with my beach friends. I just love them. It makes you wonder if all beaches are like this. Wonderful people and wonderful times watching the Ocean Stars every day. Once you start reading this book, just like the others, you are immersed in it. It seems like you are really there feeling what they do, experiencing what they do. I just hated to see the book end. Certainly can't wait til the next one comes out. Oh Joanne, you have done it again! I love, love this book. But then that should come as no surprise, I am your biggest fan. I can't say enough good things about this book. I can't wait for the next one, I have a feeling it is going to be Shane's story. Thank you Joanne for writing such fantastic books! Feels like a family reunion with each book.Picturesque Stony Beach feels like home.The character development never disappoints.So wanted to pace myself reading it,but as usual devoured it .Joanne DeMaio is a gifted writer that captures your heart.Each new book in the series picks right up where the last stopped leaving you hungry for the next one. Another great story in the Seaside Saga. The author makes you feel like you are there and can actually see the scenes. The story starts right where the previous one ends. You will fall in love with the characters and they will become your friends. I can't wait to see what happens in the next book. It sounds like it will be very interesting!! So,finally reunited with our beach friends for a vow renewal,but a storm is brewing on this special day.The black sheep of Kyle's family has returned to the scene of his crime.How does one man affect so many people? Love how this one the chapters is time stamped as events go on for just a few days. Was so concerned about how the last book left off-fearful that a breakup was is in the works for many. There's heartbreak, love, passion and so many more emotions arise in this book. Starts where the last book left off and Mitch and Carole are talking to Kyle to get him to sober up then he decides to head to the cabin in the woods-which was to be their second honeymoon trip. The whole ceremony is called off and Jason tries to pick up the pieces and get everyone back on the same wave length. Love hearing more about the driftline-precisous information. Love how the book also picks up where the other characters in the story are doing during the time frame. Others talk to Shane and find out he's a different man and he has no hard feelings against Kyle. Lauren is the one who had invited him to the ceremony. Love hearing of all the crafty decorations and feel such a connection with this group of friends after all these years. Can't wait for the next one-they are all so special. Twined wishes could be just what they need. Lots of twists and turns, unpredictable things, secrets come out and some are still kept deep within. Book title of next book in the series is shown at the end. About the author is also included. Can be read as a standalone as the author brings you up to date with brief glimpse of the past. Another heartfelt winner of the seaside saga. This one definitely was more serious and emotional of a ride for me... What the heck happened between the brothers...Will we ever know???? Still love this series so much I tried to read it slowly to savor it but it's so good I finished in record time once again! Can't wait to see what happens next for this fabulous group of characters! The friends are all here for a weekend renewal of wedding vows and one invited guest does the unthinkable. Read the book on how the past as a way of coming around full circle. I loved this book as well as all the Stony Point seaside saga. I could see this series being made into a Hallmark series. Thank you Joanne for once again taking me to Stony Point, I can't wait until the next visit. I was sort of hoping that this book would be the last of this series. I have enjoyed this authors books that took place in the town of Addison. Like to see more of them. Too short, but a good continuation of the beach series. As always, she leaves you wanting more. This has a new meaning for remembering together! Stars bring this to a threshold of new beginnings. Let’s have more! Joanne DeMaio is a New York Times and USA Today bestselling author of contemporary fiction. She lives with her family in Connecticut and is currently at work on her next novel. Joanne enjoys hearing from readers at Facebook.com/JoanneDeMaioAuthor.